I am terrible at resting! I procrastinate a lot, but not in a way that lets me relax, and by the end of each school term I usually end up getting ill as my immune system has gone to hell from weeks of not enough sleep. It’s a self destruct function that I’m really bad at disabling. I’m working on it, though. Slowly. Inefficiently. I’ll get there. I’ve finally enforced one day of rest where I get the luxury of READING for fun. And playing with the fur kids. And just goofing off. Still working on not feeling guilty. Ack! LOVE this (I’m a yoga teacher, also slightly ADD so I can relate)… and I LOVE to read others writing for inspiration, best advice ever for writers! Thanks! The best thing I did was join a Reforme Presbyterian church that honors the Sabbath (one day of rest per week). It took me YEARS not to feel guilty about it, but it keeps me sane to not work for a whole day each week. And lately, I’ve also made sure I get 7.5 – 8 hours of sleep every night. Hubby once in a while seems like he thinks I’m lazy or something (he tends to get 5 hours)… but I never nod off midday, and I never take naps. Don’t need them. Meanwhile, he can nap at the drop of a hat. I figure he gets the same sleep I do, but he breaks his up fitfully. OH, and I also haven’t been sick (even with a cold) for years… and I’m no health nut. RESTING and enjoying a little of each day is key. Don’t save up resting for a one-week vacation each year. Thank you for giving me permission to be “lazy” this weekend. The kids are going to their grandma’s house and I have a list of things I wanted to do in their absence. “Reading a book” just got moved up to the top position. Due to a health problem I tire easily so I go and have a rest during the afternoon each day if I can. This does recharge my batteries, and I feel better for it. There are the odd days when I don’t feel right and have to leave writing, which does frustrate me because I just want to get on with doing it. There are the odd days also, like last week, when my body just wouldn’t focus on anything (I had extreme fatigue after hospital appointments) and I gave in to it and rested. I *know* it makes a huge difference when I take even a few minutes to recenter — but it’s SO hard because I’m certain the world will implode if I’m not doing seventeenthousandmillion things right now! Thanks for the great reminder. Going to chill out now. Health issues and unemployment have given me alot of time to rest this summer, funny thing was, until I started making time to read and exercise (i.e., for myself) I couldn’t be creative or get anything else done. When I started my “rest” period was difficult. I was so stressed out about resting, I got nothing done because I was working all the time. Yoga, rest and reading has made a huge difference in remembering why I work. Wow. Did I need to read this today. I’ve been going almost a year without a break. Most days, I give myself no time to rest or read–which is my favorite thing in the world. OK, I’m taking tomorrow off to read a book. Yay! great post. you can apply this to your life as well as for writing. rest is anathema to modern society. it is when you are still and fully present that things become clearer and ‘problems’ more manageable. im a nap nazi when itcomes to my baby. she needs sleep to grow, learn and generate more neural pathways. i could do better by applying that to my sleeping habits. I thought I had a responsibility to go-go-go until my body finally slammed me to the floor. It’s taken a lot of time, and I still have to practice relaxing, but now I listen when my body says, “I’ve had enough.” If it feels like what I’m doing is slogging through molasses, I quit. I know that there will be a time when everything flows like water over the falls, and I take advantage of those times. Ebb and flow. The tide retreats, but when it comes in, it’s a force to be reckoned with. Try to pen it in, and all its energy evaporates. Oh, how great to hear I’m not the only one who cannot lie still. Once I went to a hypnotist to help me with weight loss and exercise…lying still while she talked, even though I was in a very comfy leather recliner in a darkened room, impossible! Twitch, twitch, and I couldn’t stop thinking about how I NEEDED to move. Great post. I no longer feel guilty about taking those days of rest. Sigh. I’ve always done mazes from the back to the front, what’s wrong with that woman? I’m still in the rest deficit from my husband’s illness, added to the guilt from feeling guilty. I’ve been actively working at establishing relationships (fancy phrase for forcing myself to be more social!) but am working even harder at giving myself a break from time to time. Having extra time doesn’t help when the muse is exhausted and the brain refuses to function. I always take breaks. Always. Years and years ago, before I realized that creativity wasn’t endless, I wrote so much that my muse vanished for two years. As a result, I’m wary of things like daily word count goals, NanoWrite, and the advice to “write every day.” Recharging is important. What.. is.. this thing called rest? I’ve never heard of it. But it sounds WONDERFUL. LOL. Mazes end to beginning. Shiny….shiny. And REST! Rest is hard to learn, but vital. And as you aptly point out, not so socially acceptable. I regularly work internationally and was initially amazed at how well other cultures were able to rest and take care of themselves and their families. It took a while, but I no longer apologize or hide the fact that I am taking some time for me. If someone thinks I am wasting my time, it is quite clear that they may need a little time of their own! Oh! I too disliked timed math tests for the same reason. Oh, Kristen! Did you ever send me on “time-travel” back to second grade! I was one of those creative types who would lose her place in the book we were reading in the reading circle. (Never did make it to the Cardinals– stuck in Bluebird mode) And gazing out the window and daydreaming, wanting to use a whole rainbow of glorious colors in a poster, instead of only 2-3, coloring outside the lines, and, in general thinking outside the box. Rest? I’m still a student at that. Thank you! I have some writer friends who aren’t much into social networking or blogging, therefore they see it is a bit of a waste of time unless they’re getting ready to market a book. For me, blogging and playing on Twitter are my fun time…and another way for me to practice my writing. Of course I’m a social person, so it stands to reason that I’d be a social (interactive) writer, too. And you’re right…having come from a career field recently where networking and relationship building was hugely important to your success, it’s very important to build lasting bonds with people. It does ensure a following for years to come, not to mention these are people who, more than likely, are drawn to you and your writing style…what better people to have as support when you come out with something new! I can’t even sit still at a red light without pulling out my phone and checking email or something. Before cell phones, I constantly surrounded myself with puzzle books. I can sit still, but my mind has to be doing something. I don’t watch tv because it’s too passive for the brain. I read, write, play games. I can’t keep my brain still. If I try, I daydream, play conversations of my characters in my head, or plot out my next scene. I have no problems being a dead body, but you would literally have to kill my brain for me to have a dead mind. Oh, and I’m signed up for your cool new class – looking forward to that, too! I am exhausted this morning. I got an email from a friend that she stayed home from work to cool it because she is wiped out. I emailed her back that I am, too. Then I opened your email and went to read this post. I thought… I”ll have to rest someday. She emailed me… how about I come over and we spend the day watching movies? I am still pondering that. It sounds wonderful, but I thought I might email her back- as long as it is English period stuff and I can write while we watch. Is that ridiculous or what? So yes. I need to take a day off. And rest. I have to go email my friend now, but honestly don’t know if I can cope with sitting still. Thanks Kristen. New to your blog and love it and look forward to seeing and reading it. my report cards always said “he doesn’t work up to his potential” I was just bored and easily distracted, focus, focus, focus. Maybe that’s why I became a photographer??? Mucahs gracias from south of the border. I would love to take Bikram yoga – but my gym doesn’t offer it, and other places are too expensive! I suppose I could do yoga in the shower. I have a pretty big shower, lol! As for resting, yes. YES. I need to take a day off from the day job. But after just taking 6 weeks off, I can’t justify a day. Not yet. So – I’ve been resting when I get home at night, rather than writing. I write in the mornings, but nights are for me. Thank you for the reminder. Hugs! In a different vein, I am a new mother (a topic that saturates the blog I’ve begun – I don’t think I will ever run out of material! And just as much as all of our to-do’s can block our creative juices, I’ve found they can block our relational juice too. Far from the ADD-afflicted (ADD-blessed?) child you’ve described in Ms. Foster’s classroom, I am the “let’s make a list and cross off as many things as we can as quickly as possible” type. When I find myself in snuggle-n-play mode with my son, I have to deliberately choose to relish in the moment. I worry sometimes, because I know I’m neglecting “necessary” tasks… I might be late to work… dinner is going to burn (if I ever cook)… what if I oversleep again tomorrow because I’m staying up? But there’s a difference between what’s urgent and what’s important – and “the important thing is to keep the important thing the important thing.” It’s a constant decision, and a constant fight against the weaknesses of whatever temperament we were born with… whether it’s type A or type ADD. I am a big believer in down time and I am married to someone who does not need it. Sometimes my body just shuts down and I stop for half a day and then I feel better. As always, a great blog. And my creative moment wasn’t a maze, but a purple lion in second grade. I knew perfectly well that lions are not purple, but this was my lion and I wanted it purple. Nice to hear from another person who spent quality time in the hall. My report card note was: Tom doesn’t seem to exert any effort in learning. Yah, like it’s supposed to be difficult. A couple months ago I instituted Lazy Sunday. When I wake up, I read in bed, then take a 2-hour tai chi class. In the afternoon, I do whatever I feel like doing. Work, errands, even the dishes have to wait until Monday. It’s the greatest thing I’ve ever done for myself – the highlight of my week! Dang…have to leave a comment just so you know I’m resting, or listen or something. But what happens when you’re resting for too long?? That can also be a problem too, like spending three weeks on one flippen chapter! Ah, deep breath here. I suppose you’ll say that it was my fourteen seconds–the fourteen seconds on my own timing–and when my mind is ready to reengage it’ll come back. *deep sigh* The thing is you’re right, or I’m right, or whatever…the point is sometimes our fourteen seconds seems like an eternity, but in the end it’s what’s right for us. BTW, when I wrote my first two novels in eleven weeks, I also read over forty-five books at the same time. Crazy, huh? I think I was more shocked than anyone since I’d not given myself the the time to read much of anything for fifteen years prior…honestly, I’m really just an accidental author. This is exactly why I homeschool-to foster my kids’ creativity and I’m very much an non-conformist. And I enjoyed it with the first set of kids (4 kids, age 21-30). But the second family, age, 8 and 10, I’m becoming more like Mrs. Foster-just too much to do, no time to get it all done, less patience, sit down, shut up, get to work…rest? hahaha. It’s nice to be remined to relax, and we were definitely in need of that. Great post, Kristen. We’re new to your blog, and found it via Kristin Nador, but we thoroughly enjoyed it and can’t wait for the next. Great reminder of the importance of balance. As I move foreward every day with the details of the day and getting it all done during the day, I often end up exhausted. I do know that when I take the time to play a card game, look at and listen to music videos, I’m revived. After completion of a project, I have a hard time going right into a relaxed state and I literally have got to get to walking or dancing to slow the energy of creation down. Thanks. I was the model student–and knew how to sit still and get my work done fast; then I daydreamed. I did lots of daydreaming. I think you people who got in trouble in class had more confidence than us shy ones. I admired you for that. Us shy people did whatever possible not to draw attention to ourselves. I think classroom environments can stifle creativity if the teacher isn’t wise and careful. I love this post about having fun, resting, and rejuvenating our creative batteries. A reminder we all need. It is SO easy to feel lazy (and guilty!) the second your not producing measurable results. I guess redefining what’s measurable would be beneficial. It’s a matter of short-term vs long-term results, isn’t it? Take a rest (short term: not productive) so that you can recharge and make even more progress later. Same with family time. It can look like a “waste” (it’s not measurable today), but years down the track it’ll pay off in the quality of relationaships you have with your kids and spouse. Indeed. 🙂 One of the best things I ever did for myself was to join a meditation group. It’s only one night a week, and the first thing we do is just SIT–for THIRTY MINUTES. There are times it is tedious wrangling my mind back to keep it still and refolding my legs because my knees have started to cramp, and then there are times like this week, when no matter how much I returned my attention to my breath, it kept wandering back to three plot points that had popped into my head while I was sitting there. Turned out, they were EXACTLY what I needed. Last year, I went cruising with my family for 8 months and spent a week anchored off the Port Arthur Penitentiary Historic Site. We did every tour, got to know the guides and soaked ourselves in Tasmania’s early (white) history. One of the things we learned was that the boys’ prisons (one in the UK and one at Port Arthur) had such good social outcomes that the English government started universal compulsory schooling (the boys mostly disappeared out of the correctional system by getting jobs). So the educational philosophy of our state schools was born from the prison system. As with the prisoners at Port Arthur, if you behave in school, follow the rules and give the right answers, you’ll do well. Heaven help the rest. I, on the other hand, keep my work area very clean and my tools organized. I know what parts I have in stock, and where they are, and I order spares before I need them so that I can have them shipped and not have to run out to a supplier during the work day to fetch parts because “this can’t wait”. Consequently, that boss is sure that I don’t have enough to do. For him, a messy work space is proof that you are hard at work and cleaning up is a waste of time that means you don’t have any “real” work to do. The fact is that if you take five minutes to put things away at the end of a job you don’t to spend half an hour frantically looking for them in the middle of your next job. Getting organized isn’t something you do when you have the time, it’s something that you make time for because it allows you to make better use of the time you have. I think it’s the same with creative efforts. I have lousy word counts–I read about people who set goals of thousands of words a day and I am astounded. Days go by when I don’t type a word. On days that I am writing I consider five hundred words productive. On the other hand, I don’t write until I’m ready. I rehearse everything in my head, and when I sit down to type something, it’s finished. On my last novel my first draft was essentially my last draft. I did some minor tweaks, expanded a few scenes that I felt I rushed through, but I pretty much published the novel as it came out, after editing for grammar and spelling. I do my best work when it looks like I’m not doing anything at all, because that time is what makes sure that when I do something, it’s done right. A few months ago, I was so TIRED of writing that my writing sucked. I was getting frustrated, etc. In that situation, the best thing I could’ve done was set it aside, spend two weeks reading books, watching movies and TV. By the time I came back to my book, I was refreshed with creativity flowing through my veins. Now I’m almost done with the revision process. Taking that break was SO worth it. Great reminder, Kristen to those of us out here with our Type-A personality. I’m so much better than when I was younger. I remember one of my daughters when she was in high school said, “Mom, come lie out by the pool with me. Don’t read or do anything.” I gulped, but trying to be a good Mom (LOL I guess maybe I was still working. Never considered that. ), said “OK.” Well, I made 10 minutes. The last five, I was going out of my head. Finally hopped up and huffed off to do my “work” whatever that was. Those of us who are compulsive “doers” get a lot done. But I’m happier and more relaxed when I give myself permission for that nap in the afternoon. After I’m charged up and ready to go. Really interesting simply anecdotally, but when it comes to the crux of the ‘dead body’ analogy, it really makes one sit up and think! I needed this! Being still is hard for me, too. And I love the squirrel photo. Yeah, I was taught work first and then, if there’s time, you can rest, relax, and play. Is it any wonder that I have a tendency toward Type A and perfectionism? Even when I know I need a break, sometimes it’s hard to stop. Is there such a thing as a work addiction? Or maybe for me it’s more of a “I must keep going until this thing is perfect” addiction. I’m supposed to be on maternity leave with my second baby. But I took on a massive editing job when she was only four months old. I get short-tempered with my children if they interrupt me before I am “finished”, whether it is the editing work I’m trying to do or the washing up. But my guiltiest secret is that I haven’t been able to give up TV. The shows I like (Sci Fi/ Fantasy like Doctor Who and Fringe) are not appropriate for watching with children around, so I wait until they have their nap in the afternoon, and (instead of immediately doing the editing work I’m supposed to be doing — gasp!) I take a break for forty minutes to catch the online re-run with close captions. And yet this time I’m supposedly wasting almost always sparks my creativity. I often end up blogging about a show and how I make use of similar plotting or characterisation techniques the show’s writers have used. Or it triggers a thought process about one of my numerous WIPs that might eventually solve a sticking point. As for reading fiction, I usually have binges. When I get into a book I often get so addicted I neglect a lot of other stuff that I should be doing. So I give myself a reading holiday once in a while, where I can saturate myself in a series of books for a month and enjoy it without feeling too guilty about it. And, again, I usually come out of this binge and begin analysing what it was that pulled me in so effectively and I try and work those techniques into my own work. Loved the post. I’ve started taking a day off a week from writing and spend it reading all the books backed up on my kindle. No word count or blog post deadlines on that day. Just reading. It’s recharges me, even if I have to fight the evil, nagging force that tells me it’s a waste of time or I should be more productive. Now doing yoga in a hot room, no thanks. Chasing squirrels? My dogs don’t allow me to interfere with their favorite pastime. I whole-heartedly agree. I’ve worked for hours, watching the word count numbers tick by and feeling proud of myself… until I stopped. At that point I more resemble a zombie shuffling through the rest of my day completely useless because my brain is FRIED. BUT, if I take the time to go for a walk in the woods, when I come back I actually get more words out that I do not have to subseqently cut or alter. My productivity and quality go up if I take the time to walk away. And, some of my best ideas have come to me while I am staring at the blue sky through the pine needles, or watching dew drops shine on flowers in the early morning sun, or even while dry dirt clouds around my foot while walking during the summer…. Sorry, what was I saying? Balance is something I’ve struggled to recapture since I started the platform-building process and got a promotion at the day-job. I’m taking a step back and looking for that place of rest. Love this! It’s exactly how I’ve been feeling lately. As a previous poster said, I, too, procrastinate, but not in a way that allows me to rest. Ugh. I go to the chiropractor, and at first, I HATED the “table” time-ten minutes lying on a vibrating table, doing nothing. Hello, I have kids to chase, dinner to cook, a house to cl…oh wait. Well, a house that NEEDS cleaning! Point is, that ten minutes of “nothing” drove me nuts! I still struggle it, but I recognize that guilty twitch for the liar it is. And your squirrel cracked me up like the nut I am. My iPhone ate a “with.” I still struggle *with* it. There, aren’t you glad I cleared that up? This blog post came at the perfect time for me. I took a day off work to relax. Even felt slightly guilty. For a split second. In truth– it was the best thing I could do for myself and my creativity. Cheers! I was so bored, I left high school after two years and went to college instead. I couldn’t sit still in high school. It had nothing to offer me. I wanted more. I like that line, things we don’t feed eventually die. That is so very true in every respect. And yes, I make sure I get some down time, most days. Your blog was sent to me from a friend and it was just what I needed. I’ve gotten so far behind it is overwhelming and I’ve just stopped and then felt guilty. Fabulous post, Kristen – thanks for taking the guilt out of rest and creative ‘playing’! This all makes so much sense. I struggle not with myself in this respect but with my partner. He is determined that in the small amount of free time we have at the weekends, we must “do something”, not waste the time doing nothing. I do try to tell him that what he thinks of as doing nothing is a positive choice for me. I need time to rest, chill out, relax, and most of all READ! Rest…. lemme check my date book…. Yeah, that’s penciled in for after the first of the year… or at least until after the house is spotless. Whichever comes first. It’s funny you mention it, Kristen, because I remember reading another post you wrote a while back about the importance of reading fiction to keep the creative juices flowing. On the way to work in the mornings, I now read fiction on the métro, and it has done wonders to jump start my creativity. Additionally, it was during the deadest part of the year in Paris (end of August) when I was apartment/dog-sitting for my boss with NOTHING to do but sit inside, where I started watching Downton Abbey and the 25th Anniversary Les Misérables concert. Incidentally, it was those two things, coupled with that period of rest (where I felt nothing but LAZY) that gave me the idea for my new novel project. The title alone was brilliant, Kristen! Nice work! Wow. You have no idea how much I needed this post. I find myself absolutely exhausted after work every day, and barely have enough energy to get out of bed on the weekends – and so my solution to this? Bang my head on a keyboard until I get some ‘creative’ words out of me. I don’t want to waste my “me” time (noveling or writing poetry or short fiction) on rest. Like you said, I feel guilt. I use my mind most of the time: writing, reading, surfing the net and at university. I use my body when walking the (old and small) dog or while on the rowing machine, not often. I also have problems shutting my brain down for the night. lessons. I though it’d be good for my writing since I write high fantasy and I will write a sword fighting scene sooner or later, also I might get into better shape. The sword lessons are so much fun! the strike or parry works better than over thinking. My mind gets to recharge while my body works. There’s no pressure to be good, it’s just for the fun of it. Also I get to hit big men with a pointy stick. Kristen, your school days were like mine. All my elementary school report cards said, “Pam stares out the window and daydreams. She does not use her time wisely.” I spent years trying to overcome daydreaming in order to be more productive. When I started writing as an adult, I realized that daydreaming was a good thing. I also found out I have ADD. I don’t remember much of my early school years, but I do know now that daydreaming and using time wisely can be one and the same. Thanks for a great post! Brava, Kristen! Your post is such a mirror for every one of us. In June, I started recording the activities of my day as opposed to having a list for the day (my adaptation of a Symeon Rodger idea). After one week of simply recording my activities– nothing less than in hour blocks or the exercise becomes a study in minutia– I recognized how I lived, which showed me how writing could fit in my life. My word count total is not extraordinary but it is consistent. The writing is focused. I have the luxury of being older so the demands of my life are much different than most of your readers but there is something to be said for appreciating how one lives, which your post relays so thoughtfully. One of your best, Kristen. Yay, thank you Kristen! Vindication for taking the summer off writing! I so needed to recharge, I had no words left in me that I was able to cohesively put on paper, or on the screen. I was the good, quiet kid in school, but I was told I had ‘too much imagination.’ Huh? At a fourth grade parent-teacher teacher conference, the teacher told my mother that I ‘read too much’ and she was ‘worried about me.’ HA! Thank you for this post! I’ve always felt like such a slacker when I would walk away from my writing to read a book or watch a movie. Consider me a faithful blog follower from this point forward! Great post, Kristen. I noticed that in my home practice, I often skipped savasana. I was so anxious to finish my yoga workout and be productive, even though savasana is my favorite pose when I take a yoga class. I now realize that savasana is one of the most productive poses in yoga. Like you I realized that a few minutes or seconds in savasana drastically affected my whole being. After a good savasana I often have incredible insight into my writing, life, and happiness. After reading some of these comments, I guess I should be feel good about the avg. 550 wpd I’ve been cranking out lately. As a working mom, I often go days without writing, but not by choice necessarily. This week, I’m taking a much-needed mini vacation and going to a motel for two nights, just me, my plot notes and my laptop. (and some snacks) I’ll do nothing but sleep, eat and write –as the mood strikes– for 48 hours. Woohoo! No kids, no laundry, no stopping (ugh!) during a brilliant fit of keystrokes to start supper. That said, I second the recommendation to read and take time away from the craft. I do that when I’m stuck or tired, and it does wonders for energy and inspiration. Wow – plenty of comments. Just wanted to say that as a historian I appreciate your understanding of the true purpose of public schools. As a yogi, I totally get your point on savasana. As a writer, I find you right on the money every time. Keep those blogs coming. For every thing there is a time and a reason…resting and recovery are essential and your blog has illustrated this wonderfully. Thyank you and keep up the good work. Kristen, this was a remarkable coincidence for me. Still trying to generate a pulse after a two-day conference – not only an attendee, but a planner and presenter as well. Thought I should catch up with everything today – did some things, but not all. Gonna take it easy and catch up with my WANAtribe. I got in trouble first day of school in grade 1 in math class. Mrs. King was handing out colored chips and said “don’t play with them”. Since the pile was disorganized, I started arranging them in piles by color. I got sent out of the class. She said “don’t play” but she meant “don’t touch”. I still remember that incident. I grew in a family where relaxing is considered laziness. Being still is a challenge, but it feels great when I manage to do it and really let myself relax. Thanks for your post. They’re always so interesting and entertaining. This post totally spoke to me! While I’ve never had too much trouble sitting still I tend to have the opposite problem. People tell me that I spend way too much time doing nothing – i.e. sitting, listening to music, and staring off into space. I grew up thinking this was bad and a “waste of time” when it’s actually a way of recharging and creating for me. College as been really challenging because I fill my days with activities and can’t ever do this. And then I forever feel guilty when I shirk work for experiences…. 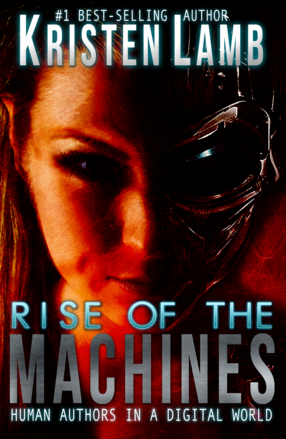 “If all of us are just efficient little workers then Skynet wins.” Rebellion against the machine? I’m getting to your post late but I loved it. I’m seriously missing rest time because there is a lot happening in the non-writing part of my life. Therefore my mind spends no time on reflection. I’m working to change that, but it’s not easy. My life seems to have a squirrel infestation right now. Hahahaha. Boy did this post resonate with me today. Nobody heard the high, screechy pitch in that ‘hahahaha,’ did they? No? Okay. Good. This weekend, I cooked. Cooking relaxes me. We put the first fire of the season on. I watched as many episodes of The Big Bang Theory as I could find. I played with the dog. The creative brain simmered on the back burner. PAHH!!! Doesn’t use time wisely…what the heck’s wrong with these teachers? I can tell when I’ve done too much in a day. I start in the morning and work until the words stop flowing, I get fuzzy eyes and the writing gets harder. That’s usually 5 or 6 hrs (on a good day) after I’ve started my writing work day. When that happens, I have no problem sitting down and watching a movie, a TV show or doing some kind of research on line. I think that taking some time off to watch the squirels makes me a much better writer! Nicole Resciniti of the Seymour Agency is one of my new favorite people and I’m looking forward to writing many, many great books for her to sell. Have a GREAT evening and thanks for your wisdom!! CONGRATULATIONS and SQUEEEEEEEEE!!!!! *happy dance* What an honor to know you all this time from caterpillar to butterfly. GO YOU! You’re the best! Thanks for the SQUEEEEE 🙂 I appreciate it!! Hopefully, one day soon, you’ll see this butterfly take off!! I think you’re reading my mind and then deciding to do blog posts on what I’m just now trying to figure out! This one is so freaking hard to integrate into my life. It goes against everything people around me believe and hold stock in. Its like it becomes a struggle to breathe. I just came back from a convention, where I purposely did not take my laptop because I would not have time to dedicate to online things. I figured I would use any extra time for actual writing. I did get a small amount accomplished, but still felt a little guilty that I wasn’t constantly checking messages and trolling for new places to market. I had down time, but it was challenging! This was awesome, Kristen! Especially since my doctor recently encouraged to go back to regular exercise, and I immediately thought, “I don’t have time for that!” Stupid me: I don’t have time not to do that! I have to make my health a priority, and that includes exercise, sleep, and time off. Great reminder! So true, but hard to remember. For me it was Mrs. Fisher, 2nd grade. My body can sit still, but not my brain. Same result…not “using my time wisely” or worse, “not living up to my potential.”. Failure? At seven? That was over 50 years ago, and I still can’t relax because of all that wasted potential that just grows with every minute that ticks by. Thanks for giving us permission, and the motivation, to just stop once in a while. We appreciate your words of wisdom. I know I’m late to the party here. But I just got my loaner computer and am now catching up. Great post Kristen. We have to take time to re-charge. Here’s my theory. We are like a sponge. When we create/write, we drain our creative juices out of our spongy brains. In order to stay fresh and replenish our brains, we need to read. We need to refill our creative spongy minds. That requires reading. I have days when that’s all I do. And it’s a great way to shut off the world, if ya know what I mean. I am in a unique position where I am not chasing a toddler around 24/7. That does make a huge difference with my circumstances. But, I don’t know how writers can write books without reading. It’s an essential element to being a good writer. I needed this today! 🙂 Thanks for making me feel better about taking a day to myself. Great observations and analyzis, as always. I discovered today that I was actually bored…My reaction was something like this: Yessss! I think I finally have managed to relax this weekend! Yohoo! But because of that woman in my head, I get very defensive when people talk to me about the fact that I write. Sometimes I ramble, trying to defend my choice to write and sometimes I might overreact to someone I’m not close to making a comment about it.